The World Intellectual Property Report 2017 examines the crucial role of intangibles such as technology, design and branding in international manufacturing. Macroeconomic analysis is complemented by case studies of the global value chains for three products – coffee, photovoltaic energy cells and smartphones – to give an insightful picture of the importance of intellectual property and other intangibles in modern production. 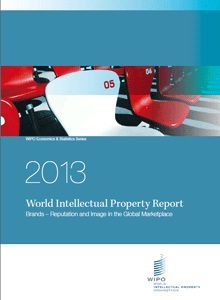 WIPO's World Intellectual Property Report 2013 explores the role that brands play in today’s global marketplace. The Report looks at how branding behavior and trademark use have evolved in recent history, how they differ across countries, what is behind markets for brands, what lessons economic research holds for trademark policy, and how branding strategies influence companies' innovation activities. WIPO's World Intellectual Property Report 2011 focuses on the Changing Face of Innovation. It describes key trends in the innovation landscape - including the increasingly open, international and collaborative character of the innovation process; the causes of the increased demand for IP rights; and the rising importance of technology markets.